This post is sponsored by Handsome Brook Farm. The photos, recipe, and opinions are mine. 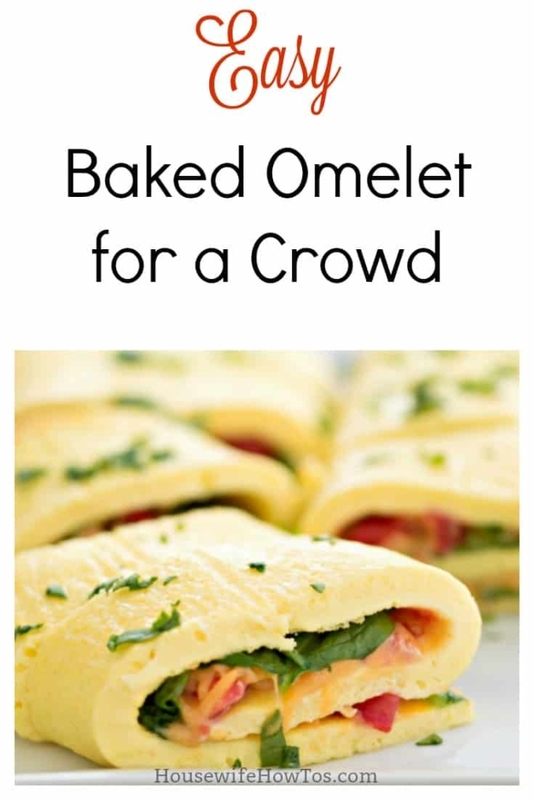 This easy Baked Omelet Recipe is one of my favorites to serve when we have company over the holidays. It’s a hearty, warm breakfast with a beautiful presentation, and it beats standing at the stove making individual omelets for each guest. Since it only needs 5 minutes of prep, you can even serve it on busy weekdays — the oven does the work while you get ready to go. We love eating eggs for breakfast. They’re an excellent source of protein and essential vitamins, so they keep us full and fueled all morning long. But not all eggs are the same — those which come from hens allowed to roam free on grassy pastures are more nutritious. Handsome Brook Farms knows this, so they treat their hens and farmers right. Their eggs come from small family farms raising small flocks of hens as part of their revolutionary network. That means their farmers get a fair wage and their hens are raised on open, grassy pastures where they are free to forage and get plenty of sunlight and fresh air. You can actually see the difference in the golden, rich yolks. 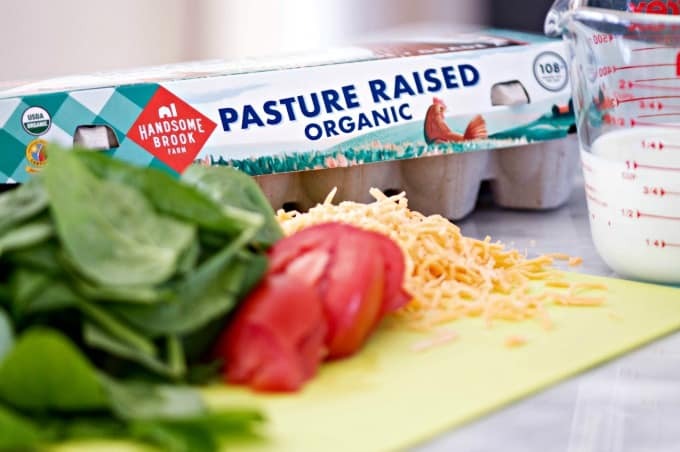 Your body will appreciate the difference, too, since eggs from Handsome Brook Farms can contain two times more Omega 3’s, 38% more vitamin A and 23% vitamin E than conventionally raised eggs. 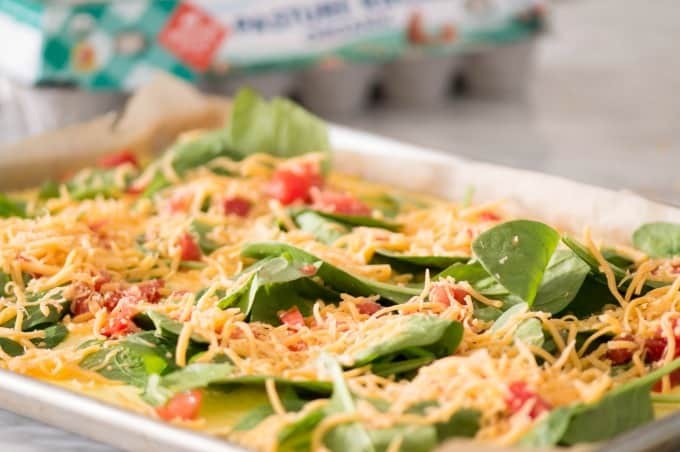 Start your recipe with Handsome Brook Farms from Sprouts or your nearest select retailer, and you’ll be starting your day right! 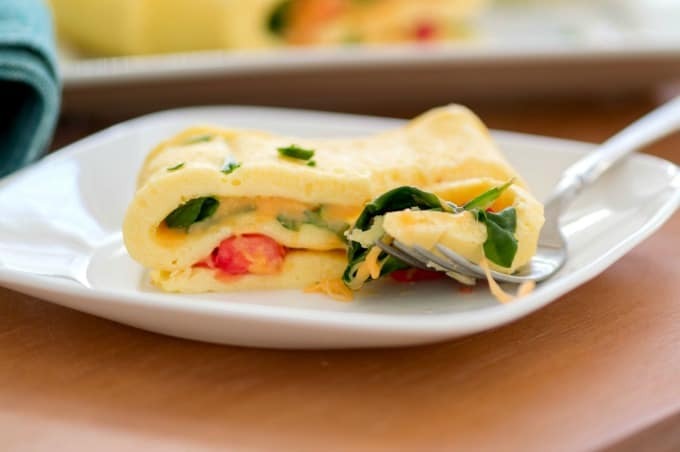 If you shy away from making omelets because they’re challenging to fold correctly, or because they always stick to the pan, you are going to love this recipe! It’s as easy as adding eggs, milk, and a bit of flour in a blender. Pour this mixture into a baking sheet lined with parchment paper and pop it into a 400°F oven for 12-15 minutes. Check after 10 minutes, in case your oven runs hot. Once the center is set, the omelet is done. Scatter your omelet fillings evenly over the pan the instant it’s out of the oven. I used fresh spinach, diced tomatoes, and shredded cheddar cheese this time but you can use the fillings you prefer. Just know that if you go with something that needs cooking, like mushrooms or onions, you’ll want to saute them first. 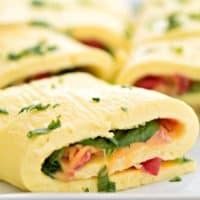 Use the parchment to roll the omelet from the long side, like a jelly roll. Let it rest for a minute or two, so the heat melts the cheese and cooks the spinach, then slice and serve. And, hey, if you’re into meal prep you can tuck a slice into your individual breakfast containers, add some fruit, and you’ve got breakfast for the week. Enjoy! Make a delicious, filling breakfast for your entire family with just 5 minutes of prep then let the oven do the rest! Preheat oven to 400°F and line a rimmed baking sheet with parchment paper. Spray the paper lightly with cooking spray. 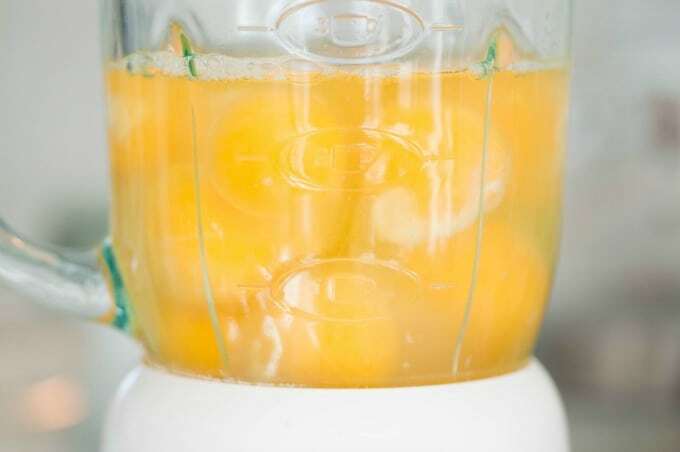 In a blender, combine eggs, milk, flour, and salt. Blend until smooth then pour into the parchment-lined baking sheet. Bake for 12-15 minutes until center is set. 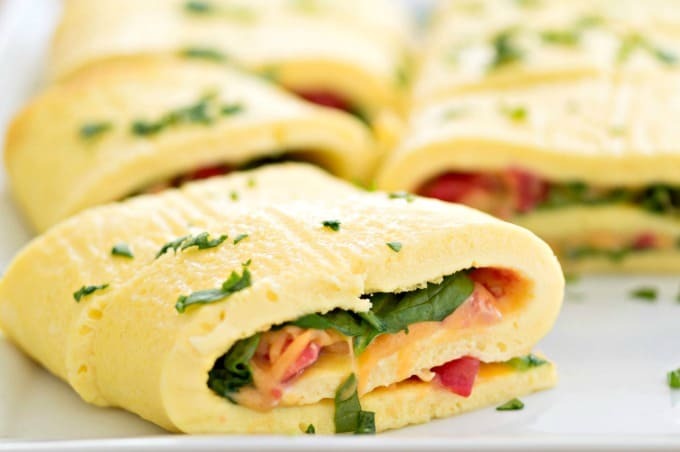 Scatter spinach, tomatoes, and cheese over the entire surface of the baked omelet. 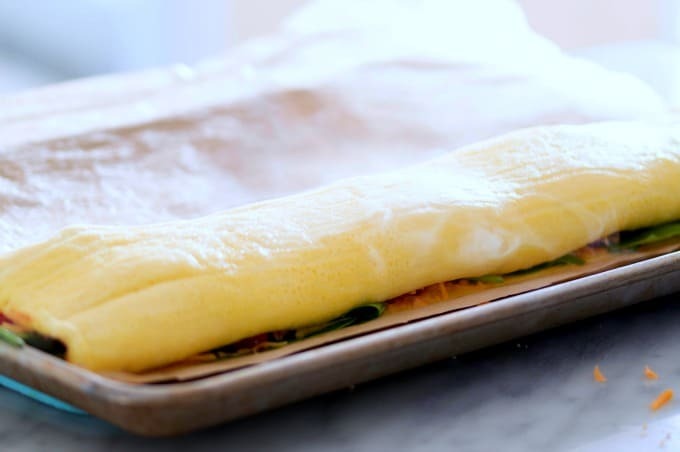 Lift one long side of the parchment paper and use it to roll the omelet jelly roll-style. Let sit 1-2 minutes for cheese to melt then slice and serve. Like this recipe? Pin it to your Breakfast board! Looking forward to making this for one of our family meals. With 6 people to feed, cooking individual omlets to go with waffles is a bit much! Just wondering (1) what size cooking sheet you use and (2) when you meal prep with this recipe how you reheat it. I use a standard jelly roll baking sheet — it’s 13″x18″x1″. When I make this for meal prep, I reheat it in the microwave at high for 90 seconds. Katie, made your recipe and divided into pita pockets for a hearty luncheon for church. thanks!